"After an enjoyable but surreal five hour train journey with the family of nine, we arrived at Dong Hoi around 6pm, jumped in a taxi and checked into our hotel. We had read that Dong Hoi wasn’t geared up for tourists and we quickly realised the reports were right. Most people head to Dong Hoi to visit the caves which are about 30 miles away. There are hardly any hotels, restaurants or bars but it is actually quite a refreshing change. It was raining so we quickly found the only 'local' restaurant within a mile of our hotel and sat down to enjoy some food. Now, I love Vietnam, for me it is by far the most enjoyable country.". Maybe Dong Hoi is - the best kept secret at the Vietnamese coast. 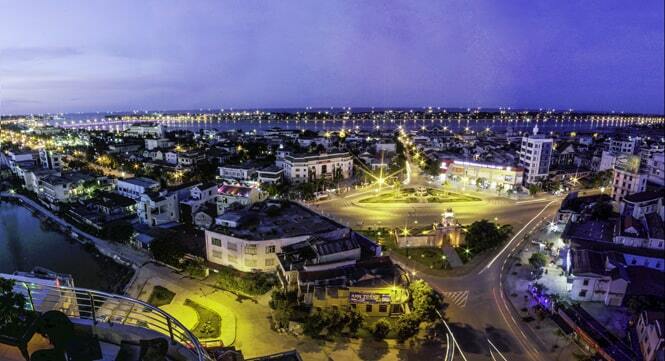 It is the capital of Quang Binh province and has about 170,000 inhabitants. The city is easily accessible by car, rail, water and air. Dong Hoi is located about 50 km south of National Park Phong Nha-Ke Bang and has kilometres long beautiful beach. In the American War, the city was almost completely bombed by the Americans. But DONG HOI has risen from the ashes and became a prosperous, orderly provincial capital. The few tourists who visit the city, use Dong Hoi as a base for Phong Nha Cave, a highly attractive system of caves in the National Park. Because the city itself attracts only a few visitors, it is a nice step off the beaten path. The Nhat Le River divides the city in two parts, before it flows into the sea. It features a landscaped promenade along the river. The greatest part of Dong Hoi is located on the western shore. 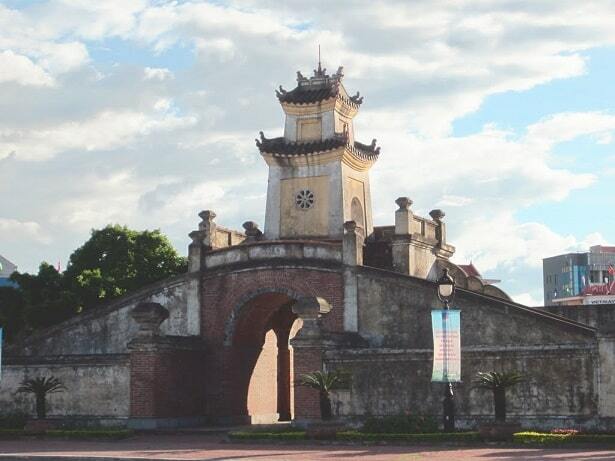 Here you'll find remnants of the Dong Hoi citadel. The only notable part of this citadel is the beautiful southern gate, which has been restored and now serves as a landmark. This is at some distance from the main part of the citadel. There is also a lively market in the town. This market is at the river and east of the citadel gate. It's an area with covered stalls. In the summer vendors sell iced glasses sweet bean chè. Just north of the citadel there are still some more ruins. This time of the Tam Toa church, which was destroyed during the American War (1965). Only the bell tower is still standing, with a few small trees. Dong Hoi is the best place to interrupt your trip, if you want to visit the "old" demilitarized zone (DMZ). Dong Hoi is also a base much nicer than Dong Ha. But it is slightly further away, and at the northern side of the DMZ you will not find many English-speaking drivers. That is a disadvantage. If you cross the Nhat Le River to the east side, you find yourself on a small peninsula, which is called My Canh. This is also the beginning of a powdery beach of 12 km long on the isthmus. This beach has soft white sand that makes a beeping sound. The beginning, where the Nhat Le flowing into the sea, is being developed as a kind of resort. There are already some hotels. 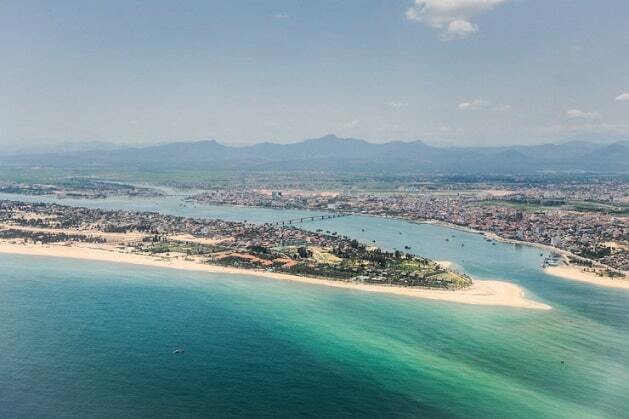 It's only a matter of time until more travellers choose to stop in Dong Hoi on their journey from Hanoi to Hue. Almost every city in Vietnam will have its own wet market, but the market in Dong Hoi is actually quite impressive in terms of size and variety of fresh products. Usually a wet market has been divided into sections. Dong Hoi you find vegetable stalls outside in the street, meat and vegetables are more into the market and in the shade. The fish market you will find at the banks of the river. The dry products, such as nuts, rice and beans take only a small section of the market in possession. Dong Hoi is also an important fishing port, so you can find the best fish here. But be careful with the consumption of seafood in the Asian countries. Some locals will warn you not to eat shellfish such as mussels, oysters and snails to prevent hepatitis. 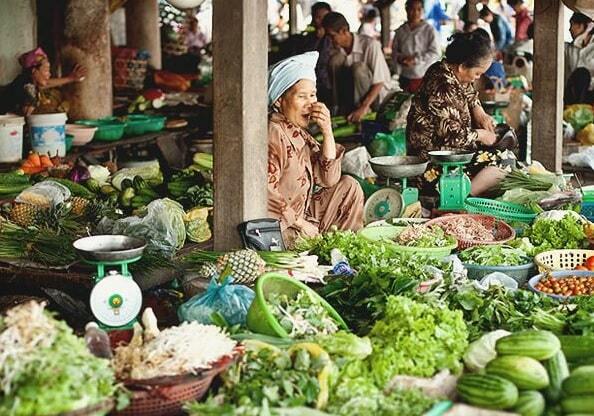 The food in Vietnam street a pleasurable activity in itself. Interrupt your eating binge once by drinking a cup of coffee in one of the many local Cafes. After Dong Hoi, you can easily travel to the Phong Nha Cave and the Ke Bang National Park.